Continental said its turbocharger technology would be used in a European carmaker's vehicle platform. July 27 (Bloomberg) -- Continental AG, Europe's second-biggest car parts maker, aims to capture as much as 13 percent of the global market for car-engine turbochargers within five years, according to the head of the project. Demand for diesel and gasoline turbochargers for cars will probably grow 50 percent to a range from 28 million and 30 million units by 2015, with a value of 4 billion euros ($5.2 billion) to 5 billion euros, Udo Schwerdel said in an interview. Continental, which will begin production of its first turbocharger late in 2011, targets sales of 4 million units by 2015, he said. The market for turbochargers, a gas compressor driven by an engine's own exhaust gases to create more power and allow for smaller engines, is dominated by U.S. suppliers Honeywell International Inc. and BorgWarner Inc., as well as Mitsubishi Corp and IHI Corp. of Japan. Continental's turbochargers are designed for use in 4-, 3- and 2-cylinder engines with about 100 kilowatts of power, Schwerdel said. Germany-based Continental's turbocharger will be produced at plants owned by Schaeffler Group, the company's controlling shareholder. The device reduces fuel consumption and CO2 emissions by about 20 percent when used together with new direct fuel injection technology, Schwerdel said. “This market is going to grow considerably especially when it comes to gasoline engines, and that's where we want to gain a foothold,” Schwerdel said by telephone yesterday. Continental said in April its turbocharger technology would be used in a European carmaker's vehicle platform. He declined to identify the automaker. Carmakers are increasingly looking to suppliers to provide entire systems instead of buying components from different suppliers, Schwerdel said. Continental also offers parts such as fuel-injection pumps, injectors and engine controls, he said. Continental last year considered a venture with Magna International Inc. to produce turbochargers, before Schaeffler pushed to work on the project with Continental. 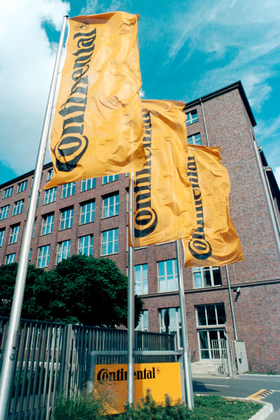 Continental has invested about 150 million euros in the technology, Schwerdel said.